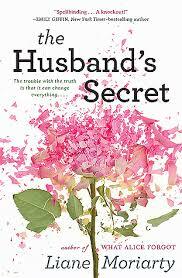 a book chick: "The Husband's Secret"
my take: I like how Ms. Moriarty's characters seem a bit superficial at first, the novel a bit house-wifey ... and then she blows up their world (see cover pic of a pulverized flower) and their humanity breaks into their perfect facade, each character reckoning with their own folly. What to do when you find a letter in the attic that's addressed to you ... only to be opened on the event of your husband's death? Cecelia finds such an envelope while her husband's on a business trip. Her story line and two others (Rachel and Tess) converge in the local school. What's okay to keep secret and what do we need to tell are two questions that would be worth discussing after reading. my source: My sister Jennifer handed this me this one. my verdict: Good read, especially for vacation. I like the books of hers I've read - fairly easy to get into, though not particularly memorable enough to stand alone in my brain: they're jumbled. But it's a pleasant confusion. "A pleasant confusion" - love it. That's exactly the kind of thing I like to read whilst vacationing. And I always like how her books are light but still have some added twists/complications that make you think.